Place the chimichurri ingredients in a food processor and pulse to form a thick sauce. Heat an indoor griddle or grill pan to medium-high heat or heat the outdoor grill. Bring the steak to room temperature and pat dry. Dress with EVOO, salt and pepper. Parboil the sausages in 2 inches of boiling water to heat through. Drain, pat dry and dress with EVOO. Dress the shrimp with EVOO, salt and pepper. Combine the paprika, cumin and coriander and sprinkle evenly over both sides of the steak and over the shrimp. Grill the steak fir 5 minutes on each side for a pink center. Grill the sausages to crisp the casings, 5 minutes. Grill the shrimp for 3-5 minutes, turning frequently until pinkish, opaque and firm. Douse everything with lemon or lime juice. Thinly slice the meat on an angle against the grain (as best you can with flat iron steaks). Arrange the mixed grill on a serving platter and serve with the bread, tomatoes, arugula or greens and chimichurri alongside. In Recipes-list.com we have selected the most viewed recipes from category - uncategorized . Enjoy the best recipes specially selected for you! 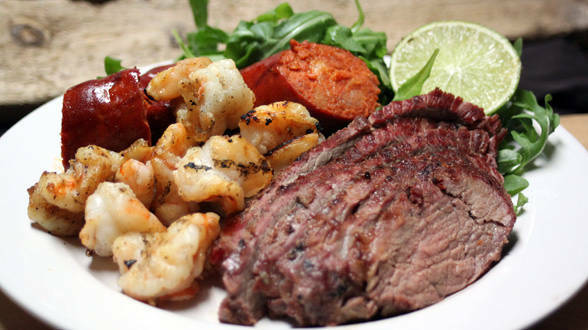 Argentinean Mixed Grill is the right choice that will satisfy all your claims.